Your order ships via USPS Priority Mail! a Gift Certificate is always a great option! please add one to your cart when ordering. Slip on your own cell phone holster with a "J" hook style belt clip and you are ready to experience one of the most comfortable deep descreet concealed carry methods on the market. The Genuine Cell Pal holster IS the utltime in concealed carry holsters. The cell phone case is a critical part to your Cell Pal Holster. 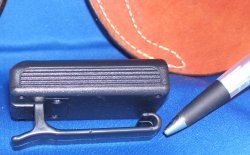 Your Cell Phone case must have a "J" style belt clip to work correctly with this holster. If you don't have a J-Hook cell phone case please order one at the same time you order your new Cell Pal Holster. Not sure what a J Hook is? Click here for more details on J Hooks. We encourage you to order one of the cell phone cases offered on this site. We know how they are built and we know that they work. You can scroll down and check out a wide variety of cell phone cases or email us with the model of your phone and we'll do our best to help find one that will work with your phone. Remember when ordering, this is a CROSS DRAW holster. Orientations listed in the drop down refer to your shooting hand not the side where you will wear the holster. 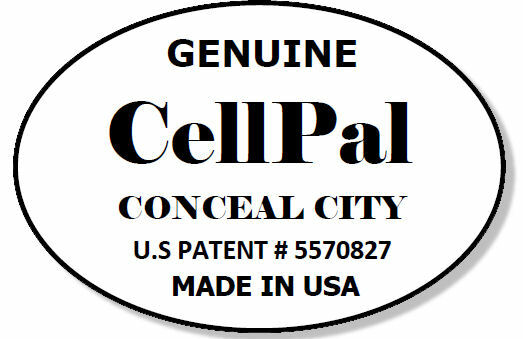 You are about to order Conceal City's GENUINE CELL PAL HOLSTER - Each holster bears the Genuine Cconceal City Cell Pal embossed stamp and confidently displays Conceal City's United States Patent number 5570827. You know it's REAL because you can see the SEAL! please add one to your shopping cart when ordering. It is necessary that your Cell Pal holster be accompanied by a Cell Phone case that has a J-Hook. The Cell Cases we offer have been specifically manufactured or modified to work in concert with your your Cell Pal holster. We urge you to order a Cell Case from us at the same time you order your new Cell Pal Holster. Also, cell phone sizes are ALL OVER THE BOARD these days! As of this writing the smallest cell phone on the market is as small as two fingers while the Galaxy Note 5 is the current industry giant measuring at 6.03" x 3.0" x 0.3" in.! We've got you covered! If your aren't sure which case to order, email us with the measurements on your phone. and we will recommend what's best. If we don't have one for your phone, we're most likely in production for it. Concealed Comfort is now an Authorized Dealer for NiteIze. The NiteIze line offers an additional selection of compatible cell phone cases to be used with your Cell Pal Concealed Comfort holster. Although these were not engineered for the Cell Pal holster, we have specifically customized each NiteIze case at our facility before we ship them to insure they provide the proper level of service to our customer. The NiteIze Sideways cases offered on this page have been specifically modified to work with the Genuine Cell Pal Holster. * Works great as a discreet way to carry an extra magazine! - this one works with your iPhone 4/4S without extra skin, LG View, Instinct , Droid, Droid 2, Evo 4 and similar sized phones. 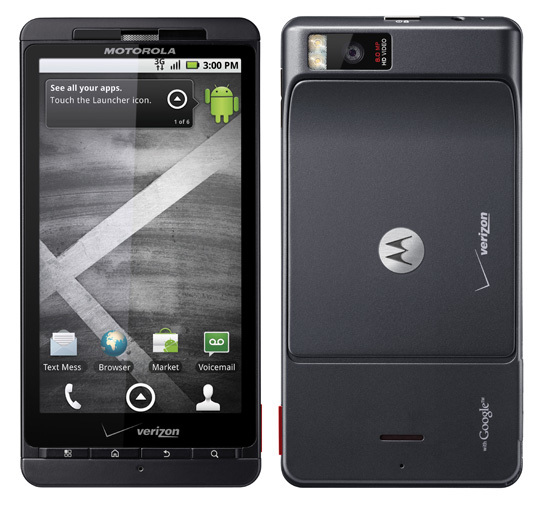 - Perfect for the Droid X and similar sized devices and OtterBox enhanced devices also the LG - HTC - New Motorola Razor - Iphone 5 , Galaxy S III & S4 and phones similar in size. This cell case has elastic sides and will stretch. 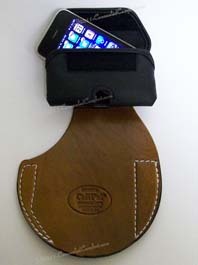 It is important that the cell phone case you have now is designed to work with the Cell Pal Holster. 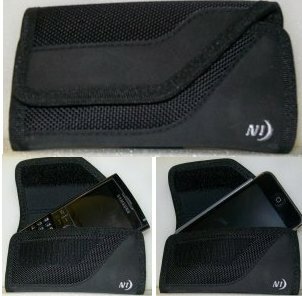 If you plan to use your existing cell phone case, check to be sure it has a “J” hook style belt clip. This format is critical to the successful use of the holster. If you aren’t exactly sure of what we mean by a “J” hook belt clip, take a look at this illustration. Although this is a picture of a Pager, it’s a clear illustration of what the “J” portion of the hook should look like. This curl inward at the bottom of the belt clip, grasps the holster and keeps it in place while you’re wearing it. Your cell case should have something similar. If your existing cell case doesn’t have this, now’s the time to take action.